About eight-in-ten Americans (81%) cited curiosity as a major or minor reason they follow science news, far higher than any of the other six reasons asked about (all but one of which are personal, such as science’s relevance to one’s everyday life, hobbies or children). However, one notable driver for seeking out science news is a sense of obligation to the broader community: About half (48%) of those surveyed said they follow science news because they feel a civic obligation to do so. 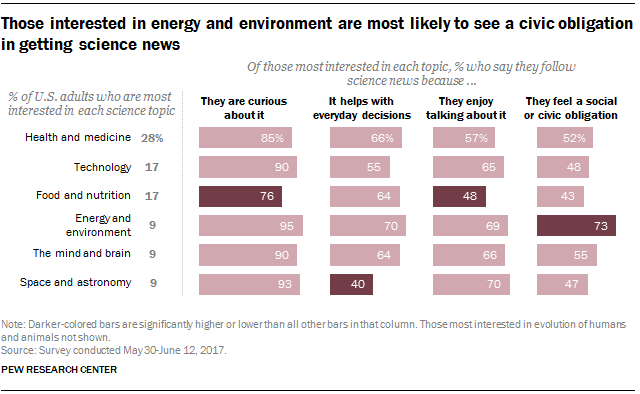 Those with a high interest in energy and the environment stand out as particularly likely to say that feeling a social or civic obligation is a reason they follow science news (73%) – though nearly all of them (95%) also cited curiosity as a reason. The higher sense of civic obligation in this group holds true regardless of party identification, even though they are more likely to be Democrats (67% are Democrats or Democratic-leaning independents) than those who prefer other science topics. As for other reasons people follow science news, 57% of Americans said it helps them make decisions about their everyday life, and 56% said they follow it because they enjoy talking about it with others. Half of Americans said they follow science news because it is related to their hobbies. 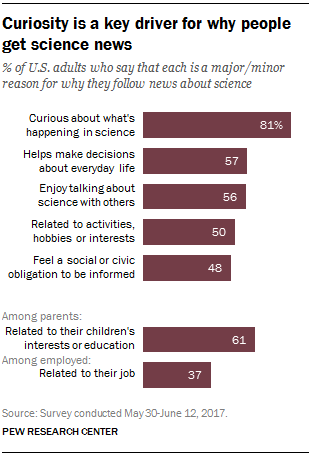 Among parents, 61% cited its relevance to their children’s interests or education, and among working adults, 37% said they follow science news because it is related to their job. While curiosity was the most common reason given across topics, those most interested in food and nutrition were less curiosity-driven and less likely to see enjoyment in talking about science as a reason for following science news. Additionally, space and astronomy enthusiasts were least likely to say they follow science news because it helps them make decisions about their everyday lives (40%, vs. 55% or higher among those most interested in other topics listed). Those most interested in technology stand out for citing science news’ connection with their jobs. About half (52%) of employed Americans who are most interested in technology said they follow science news because it is related to their work, at least 11% higher than any other group.